Yes, there’s a key in our challah this week. And no, I don’t think it will be the source of our wealth. But I do think it will make my kids giggle and squeal when we cut it open. 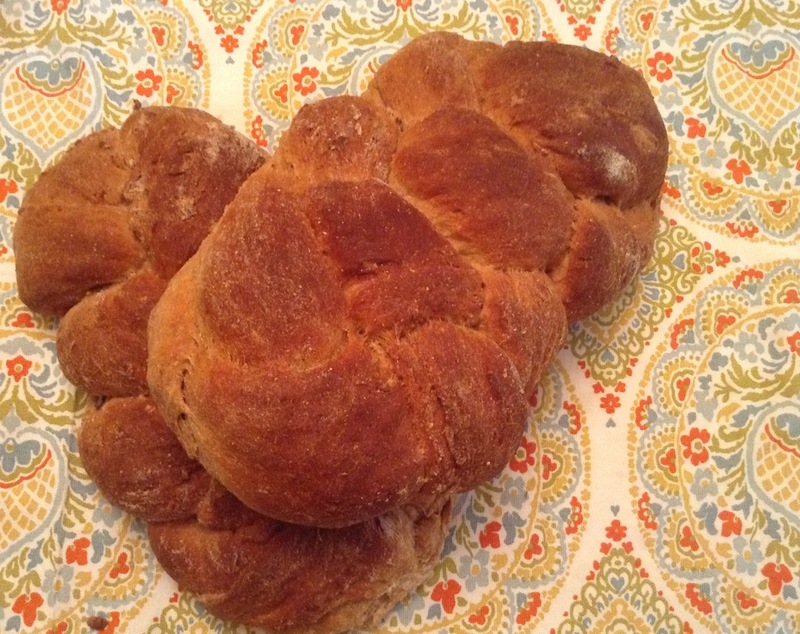 So in honor of the schlissel challah for this Shabbos after Pesach, I’m reposting our foolproof challah recipe. This 100% whole wheat challah has a secret ingredient that makes it as soft and fluffy as white flour. Only, I’m not sure which it is. I’ve managed to narrow it down to two, though: a cup of gluten or davening. And I’m pretty sure it’s a combination of both. That’s right, davening is one of the ingredients. I received this recipe from a friend who speaks, acts, cooks and bakes with more gusto than almost anyone I know. She included davening as part of the recipe’s instructions, and since it’s challah after all, I listened. During the kneading and the bracha (I use 5lbs. of flour), I daven for everything I can think of at the time, and I’m sure to ask at the end that the challah should turn out yummy. And it does, every time. But since God helps those who help themselves, be sure to add the gluten. Mix all of the above in a medium bowl and let it sit until it bubbles (at least 10 minutes). Dig a well in the dry ingredients and add all the wet ingredients and the yeast mixture. Mix it with a hand-held mixer (or a Kitchenaid, if you’re the type to keep that behemoth on your counter) until it’s no longer so wet. Pour it on the counter and knead it with your hands. If it’s very sticky, add more flour. The dough should bounce back up with you poke it with your finger. Lightly oil the bowl and return the dough to it. Cover it with a warm, wet towel and leave it in a warm place for at least 2 hours (I put it in the oven, with only the light on). I normally braid this challah with four strands (click here for a demonstration), but on Rosh Hashanah, I make them round. I roll the dough into a long, thick strand and sprinkle cinnamon and raisins on it before rolling it up like a snail. Bake at 350 degrees for 35-45 minutes depending on the size of your challahs.